Are Veteran Pension Benefits Retroactive From the Date of Disability? 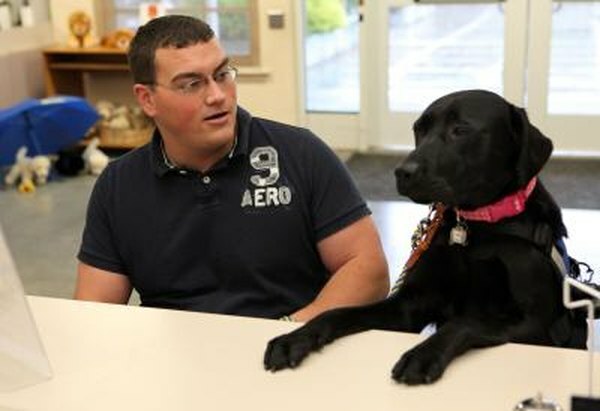 Vets with service-related disabilities may qualify for assistance dogs under federal benefit programs. 1. What Is a Pre-Determination Letter for Health Insurance? 3. I Applied Two Weeks Ago for Social Security Benefits: When Do I Get Paid? The Department of Veterans Affairs accepts and reviews claims made by members of the armed forces and their families for a variety of disabilities, including diseases, debilitating injuries and also aggravation of pre-service conditions. Approved pension benefits paid by the VA begin from the date the veteran files a claim, according to administrative rules. Retroactive payments reimburse vets for failure to pay valid claims, time waiting for approval for valid claims and underpayments for approved claims. The VA approves claims for disabilities resulting from injuries and diseases occurring during active military service as well as for injuries aggravated as a result of required service duties. Some diseases or injuries develop after the veteran leaves service, and the department grants disability compensation when the vet documents that the illness or condition is directly related to the required service duties. Types of disability benefits include Dependency and Indemnity Compensation paid to some surviving family members for veterans who died from service-connected disabilities. Special Monthly Compensation is given to veterans and some family members to help cover costs for aid or assistance from another person to help with specific disabilities, such as loss of limbs or brain injuries. Disabilities qualifying for benefits from the Department of Veterans Affairs include only those injuries directly related to the time in service. The veteran must provide documentation with the claim to show the injury, illness or aggravation of a condition occurred during required service. Vets must also show later health issues result from an assignment done while on active duty. Some disabilities occurring after active service fall under the classification of presumptive disabilities. This means the VA recognizes the disability as a typical condition as part of service, but benefit payments don't begin at the time of exposure or the time of the disability. For example, presumptive conditions for military members assigned to submarines include several types of cancers and brain tumors. The disability date listed on the benefit claim identifies a specific calendar day for benefit payments to begin, and the veteran typically receives this notification with the claim approval. The date the disability happened has nothing to do with the actual benefit payments, but specific dates are important for acceptance of the claim. A Vietnam veteran claiming disability benefits due to exposure to Agent Orange, for example, must prove service during the time the chemical weapon was used and also provide documentation that the vet was stationed at that date in the area of possible chemical exposure. Veterans and family members receive retroactive pension benefits for disabilities for approved claims requiring months or years to investigate. Many veterans also receive retroactive pension payments from the date of the claim when new rules recognize previously denied claims. Veterans denied benefits for specific disabilities that are not covered may also receive retroactive payments for claims when the VA changes official regulations to recognize presumptive conditions. New medical research and veteran legal challenges sometimes guide changes in disability rules, and they also assist veterans by expanding VA benefit allowances. Are Retroactive Social Security Disability Benefits Taxable? Will My Under Age Child Receive Social Security Benefits Because I'm Disabled?